Anyone who has taken one of Pro­fessor of History Ken Calvert’s classes knows about his love of the overhead pro­jector. Instead of the digital pro­jectors wired into the ceiling of each classroom, Calvert prefers a boxy con­traption illu­mi­nated by an incan­descent light bulb that looks like it belongs in a “Looney Toons” episode. But Calvert is proud to be a Luddite. Calvert is not alone in his affection for the tech­nologies of the past. Sophomore Jonah Davey typ­i­cally types the drafts for all of his papers on a type­writer. Davey said doing so helps him distill his thoughts and write more effi­ciently, in a way that neither hand­writing nor typing on a com­puter would allow. “It’s a low-tech device that func­tions for me as an accel­erated form of hand­writing,” Davey said. Even the college itself still adheres to the past. 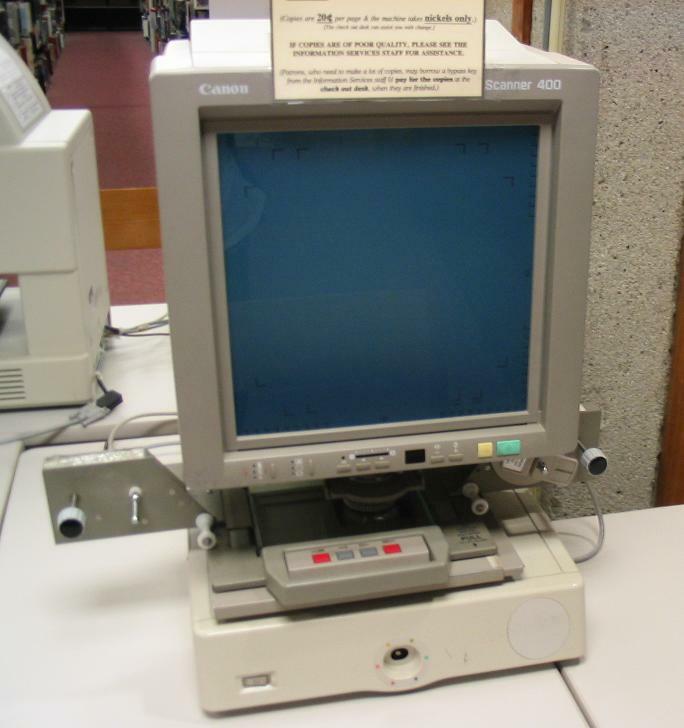 Although now rarely in use, Mossey library has two micro­fiche readers as well as a microfilm reader. According to Public Service Librarian Linda Moore, the college is in the process of slowly phasing out micro­fiche. For example, the college used to have a number of books in its micro­fiche cabinet, but once these were pur­chased online, the physical copies were dis­carded. Addi­tionally, the college has pur­chased a scanner that allows micro­fiche users to make indi­vidual copies of micro­films. “If someone decides a microfilm is important, it becomes available online,” Moore said. As new tech­nologies quickly overtake older ones, the library tends to accu­mulate mul­tiple copies of the same thing. Moore said this has hap­pened most notably with the New York Times. The college owns hard copies, micro­fiche ver­sions, and the online version of the NYT archives. “It’s America’s paper, so to speak,” Moore said. According to Moore, another problem with the con­stant onslaught of new tech­nology is the hard decision of whether to replace existing cat­alogs or create new ones. This becomes most evident in the library’s tran­sition from VHS tapes to DVDs for the film col­lection. Some things in the VHS library are irre­placeable, and as the library tran­si­tions from DVDs to Blu-ray discs, the same is becoming true. “Keeping up with the tech­nology as it evolves can be a real issue for the library,” Moore said. Even more pressing, however, is the issue of when to finally let an old tech­nology go. For instance, the library no longer stocks vinyl records because it no longer has record players. Some tech­nologies, however, are so old that they never will leave. Moore pointed over to the table near the copy machines. “Paper cutters are not cutting edge, so to speak,” Moore said. Tech­ni­cally, this really isn’t old tech­nology… it’s people unwilling to give the stu­dents the benefit of new tech­nology. Calvert should have been put out to pasture years ago… maybe a comedy club will take him? So mean. I’m 63, so I was one of the last classes to take ‘slide rule’ as a requirement at engi­neering school. These older tools are slower but they are more intu­itive and you learn the material better, in my view. Not every­thing ‘cutting edge’ is a better edu­ca­tional tool. And cer­tainly the ‘new tech­nology’ comes with all the ‘bugs’ in it-better to wait a couple of years so they can debug it before your school deploys it. Sounds like your school was on the cutting edge, I’m 56 and we used “slide rule” in my freshman year in college. This is 2018, not 1974 and we are talking written pre­sen­tation material. And not mean at all… that is this teacher’s passion, comedy, which if you had any involvement with the school you would have known. I do have involvement with the school, which appar­ently you fail to rec­ognize. A lot more than you might imagine. In watching your posts here, you know little about the town and even less about the spe­cific teachers. Little is left to the imag­i­nation there.… but wow me. You should read them and not ‘watch’ them. Are you waiting for some­thing to happen? You have to be a magician to attract people’s attention nowadays, it’s the result of com­puter games, smart phones and tablets, I suppose? In my day we used our imag­i­na­tions, not twiddled our thumbs. And I bet you walked 5 miles in the snow to school also. i get the feeling calvert is 90. is he 90? I get the feeling you’re 12. Are you 12? “calvert is proud to be a luddite” and teaching your kids. and this is cel­e­bratory? ok. when your kid comes to my interview and doesn’t know how to pow­er­point, i’m pointing them to you. Devel­oping the ability to think crit­i­cally is more important than pow­er­pointing or cre­ating Excel spread­sheets. I’ve used both tools hun­dreds of times in my career and value their capa­bility, but they are just that-a tool. Cul­ti­vating the human mind at a for­mative age is vastly more important than learning how to use a time-saving tool, you can do that anytime in your career. Tech­nology is devel­oping with time ratio and this is why the analog side is really ignored and there has some­thing to satisfy that place too.